Last night, I found this site called imeem.com. 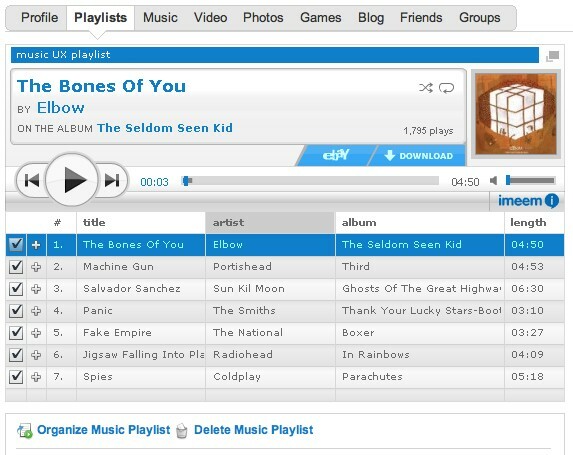 It's sort of a social networking site where the focus is music and video sharing. I created a playlist of songs to embed in my blog but then found that a few of the songs were a little choppy. 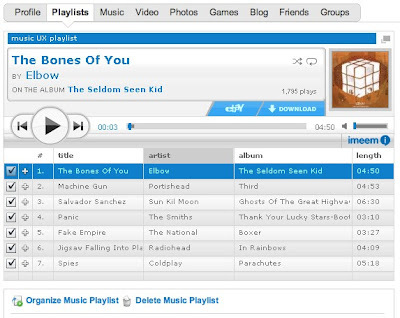 Today, I went back into the playlist on imeem to remove the choppy songs. I found an 'organize music playlist' button which allowed me to rearrange and delete songs but NOT add new ones. I looked for an hour and couldn't find a way to add new songs to my playlist! This is really frustrating. An 'add songs' button would be perfect and should be located either on the playlist or 'organize music playlist' popup. Great blog TommyG! I think you need a photo, though!